I profiled the shenanigans in the District 13 Democratic primary here and here. Long story short, a husband and wife both filed for delegate as did an uncle and his niece. The wife, School Board Member Janet Siddiqui, withdrew at the last minute to refile for School Board but her husband, Nayab Siddiqui, stayed in the race. Both Vanessa Atterbeary, formerly a candidate in District 18, and her uncle, incumbent Del. Frank Turner filed and neither dropped out. Del. Guy Guzzone, who is running for Senate, originally planned to form a slate with incumbent Del. Shane Pendergrass, Del. Frank Turner, and Janet Siddiqui. Now, Guzzone, Pendergrass, and Turner have decided to put Vanessa Atterbeary on their ticket as its third candidate for delegate after a series of interviews with the prospective candidates. Nayab Siddiqui and Vanessa Atterbeary both had inside knowledge that someone was going to drop out–or else why on earth would they have filed? And now Team 13 has added the niece of an incumbent delegate to the slate. Atterbeary, 38, is new to Howard County, having run four years ago in District 18, and participating in Leadership Montgomery two years ago. Congenial enough but running an unskilled campaign that made many missteps (see here, here, and here). But it’s good to know the Montgomery produces such great leaders that Howard feels compelled to import. So why Vanessa Atterbeary besides the link with her uncle? One reason might that her very successful father, Knowlton Atterbeary, and his connections could help provide significant financing for her campaign and for the slate’s campaign account. During the 2010 cycle, he cut Ike Leggett a check for $2000 and I imagine that, as much as he likes Ike, he loves his daughter. Much of Atterbeary’s funding last time around came from loans to her own campaign totaling $59K. She may well have earned all of that money or she may have gradually accumulated it through perfectly legal gifts from her parents. Once the money is legally hers, she is legally free to loan it to herself. Her access to money is not unusual and is not a reason to attack Vanessa. The way she ended up on the slate against an array of generally weak candidates through this very timely withdrawal of J. Siddiqui rather than past work gives much more pause. My bet is that at least some people in Howard County agree. UPDATE: Vanessa Atterbeary works for KRA, her father’s company. So the machinations just keep on going in the District 13 House of Delegates race. Earlier today, I reported that D13 featured the unusual spectacle of husband (Nayab Siddiqui) running against his wife (Janet Siddiqui) and a niece (Vanessa Atterbeary) challenging her uncle (Frank Turner). Today was the last day to withdraw from the race (i.e. get off the ballot), and lo and behold, School Board Member Janet Siddiqui has dropped out of the race. She had formed a slate with incumbent Dels. Frank Turner and Shane Pendergrass but not her husband. The “All in the Family” aspect seems less strange (not to mention very awkward at home) than very calculating. Janet Siddiqui’s withdrawal from the race leaves it open for husband, Nayab Siddiqui, who is not currently an elected official. Del. Frank Turner may have had an inkling that this might happen and encouraged his niece, former District 18 Candidate Vanessa Atterbeary, to jump in too. Pure speculation but it sure makes a lot more sense than the idea that she wanted to take her uncle’s seat. UPDATE: The Baltimore Sun has more details. Niece against uncle. Husband against wife. 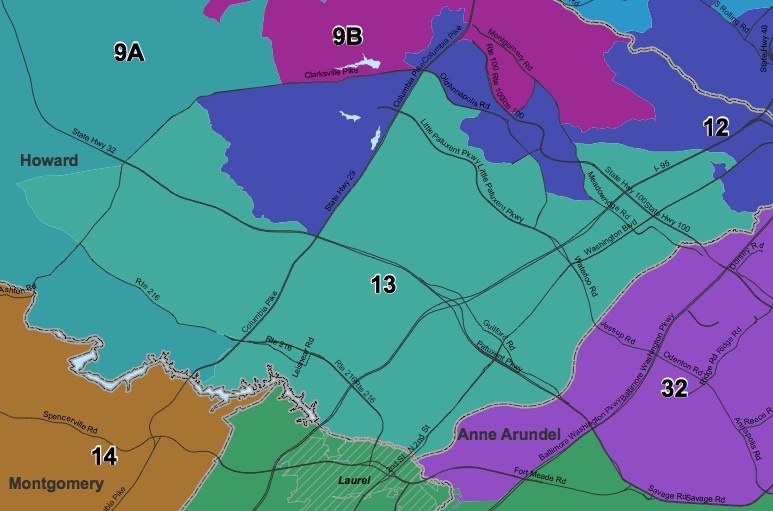 It’s All in the Family Howard County style in District 13. Nevertheless, today I focus on the Democrats. Incumbent Del. Guy Guzzone is running for the open senate seat. He has an astonishing $410K in his campaign account because he was thinking of running for Howard County Executive. This nice guy with vast funds in a Democratic district should have no problem against the sole Republican who lost the GOP primary in 2010. Guzzone has formed a slate with three delegate candidates, incumbent Dels. Shane Pendergrass and Frank Turner and School Board Member Janet Siddiqui. Pendergrass has a robust $112K in her campaign account while Turner has $56K and Siddiqui has $45K. All perfectly normal except that also running are Nayab Siddiqui, Janet Siddiqui’s husband, and Vanessa Atterbeary, Frank Turner’s niece. Nayeb Siddiqui filed an affidavit attesting that he raised and spent last than $1000. Vanessa Atterbeary has not filed a campaign finance report, or at least I cannot find it when I search for it. Surely, not everyone related is related in District 13? Someone should call Shenanigans! on this play. 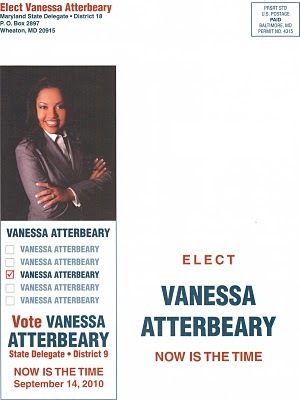 In 2010, Vanessa Atterbeary ran for the House of Delegates in District 18 in Montgomery County. The district encompassed Chevy Chase, Kensington, Wheaton and part of Silver Spring. She came in fifth–2509 votes behind the third place nominee, Del. Al Carr, and 989 votes behind the fourth place finisher. Vanessa came across as a highly personable but politically inexperienced young woman. Her campaign used the hackneyed slogan “Now is the Time.” Even worse, one mail piece had the wrong district number (see below). Another featured pictures of Vanessa with elected officials that did not endorse her, leading them to repudiate the piece. In short, she was young and had interest and potential despite having much to learn about both policy and campaigns. She hosted a fundraiser for Ken Ulman in 2012, so she dived back into politics quickly after she moved to Howard County. One other Democrat, Fred Eiland, has also filed for the delegate race. Like Nayab Siddiqui, he has filed an affidavit, which makes me wonder if he is somehow related to Shane Pendergrass. The only other question remaining is whether N. Siddiqui, Atterbeary, and Eiland form a counter slate.